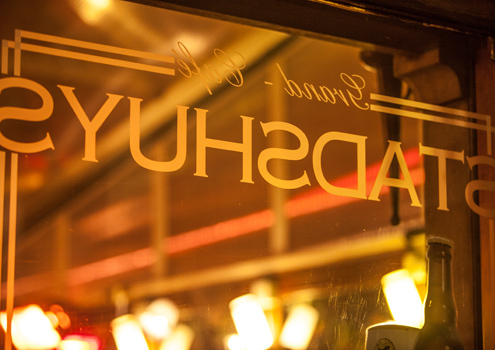 Another little haunt well worthy of note has to be the Grand Café Stadshuys, situated – as the name suggests – on the Grote Markt itself. Not anywhere nearly as expensive as such situation usually dictates, this cosy establishment offers a good range of beers both bottled and on tap, together with quite an array of wines and spirits, and a simple snack menu offering a variety of croques, focaccias and local fare. Pleasant staff and an almost Flemo-Georgian interior make this an interesting little watering hole which certainly doesn’t stand on ceremony. Give it a try as you amble around the glorious town hall square.